Two categories of test viz. (1) Commercial and (2)Confidential will be carried out at Northern Farm Machinery Training& Testing Institute (NFMT&TI), Hisar and other Farm Machinery Trainingand Testing Institutes (FMT&TI). a) Initial commercial tests on indigenous or imported prototype machines ready for commercial production. b) Batch test on machines which have already undergone initial commercial test and/or are being manufactured commercially in the country. c) Test in accordance with OECD Standard Test Code: shall be undertaken on machines (which have already undergone initial commercial test) on the specific request of the manufacturer/applicant, exclusively for export purposes. Confidential Tests are for providing confidential information on the performance of machines, whether ready for commercial production or not or to provide any special data that may be required by the manufacturer/applicant. Machines may be tested at the request in writing of the manufacturer/accredited importers referred to as applicant hereinafter. Tests will be carried out at the discretion of the Director, Northern Machinery Training & Testing Institute, Hisar or Director, of any of the Regional institutes, hereinafter referred to as ‘Testing Authority” to whom application on prescribed form may be addressed. For testing of tractors only Director CFMT&TI, Budni will be recognized “Testing Authority” for the whole country. All the tests will be conducted as per IS Test Code. If for any machine/component the IS test code is not available, the test code shall be framed by the Testing Authority whose decision shall be final. The amount of test fee and other estimated expenditure will be intimated to the applicant who will deposit it in advance through a Bank Draft drawn on the bank mentioned in the application form in favour of the Director of the Institute. The advance will be adjusted at the end of the test. The applicant shall deposit the balance charges payable in the manner indicated above, before test report is released. (i) All charges on account of test fees, stores, fuel, oils, lubricants, spare parts, general stores, work-shop charges other items as laid down by the Ministry of Agriculture labour overheads incurred during the test shall be borne by the applicant. (ii) If the tests are carried out at a place other than the premises of Northern Farm Machinery Training & Testing Institute, Hisar or the Regional Institutes, all transportation charges to and from the place of test, traveling allowance/daily allowance of the staff, etc. shall be borne by the applicant. (i) Parts of assemblies of machines worn out or damaged during test shall be replaced/repaired by the applicant free of cost within the time specified by the Testing Authority. The cost of laying foundation, fixtures, etc. which are not normally available at the Institute and which are found necessary for working of the machine under test and all special store items shall be borne by the applicant. Parts and assemblies of machines worn out or damaged during the test may be handed over at the discretion of the Testing Authority only after the test report has been released. The applicant will make his own arrangement to collect the machine within one month of intimation by the Testing Authority. If the applicant fails to remove the machine in this period, the applicant will be liable for payment of ground rent as fixed by the Testing Authority for a period not exceeding four months. After the expiry of 3 month one month notice will be served on the applicant by the Testing Authority. If the applicant fails to remove the machine within the period the machine will become the property of the Institute and may be disposed of by auction at the discretion of the Testing Authority. If any un-patented machine or a machine in respect of which a proper application for patent has not been duly made, is submitted for test, it will not be published or disclosed to the public by the Central Farm Machinery Training & Testing Institute or Regional Institutes and the matter will be treated as confidential so that the right of the investor or a person claiming through him to get a patent for the machine is not prejudiced. If in the course of testing a machine/component, any invention/and/or developments originate from the officers of the Northern Farm Machinery Training & Testing Institute, the Government may at its discretion take out separate patents to protect the subject matter invented and/or developed. If a machine submitted for confidential test has been tested as per relevant commercial test procedure and the procedure followed for commercial testing has been observed in all respects, then on the request in writing of the applicant, the confidential test report may be converted to commercial report. If a machine is already in commercial production in India, the sample for batch test shall be new and be selected by the Testing Authority or his accredited representative at random from series production. No alteration/modification that would alter its practical performance shall be allowed thereafter. If the test is related to some branch of development work on which the Testing Institute is engaged, the whole or any part of the test fee may be remitted with the approval of the Ministry of Agriculture. No test fee or other charges will be levied for commercial testing of machines developed by research units or ICAR or other semi-Government organizations, universities or State Government Departments. (i) The commercial test report may be used commercially by the applicant and may be published in full without any alteration or omission. No extract or abbreviated version shall be published without the written approval of the Testing Authority. 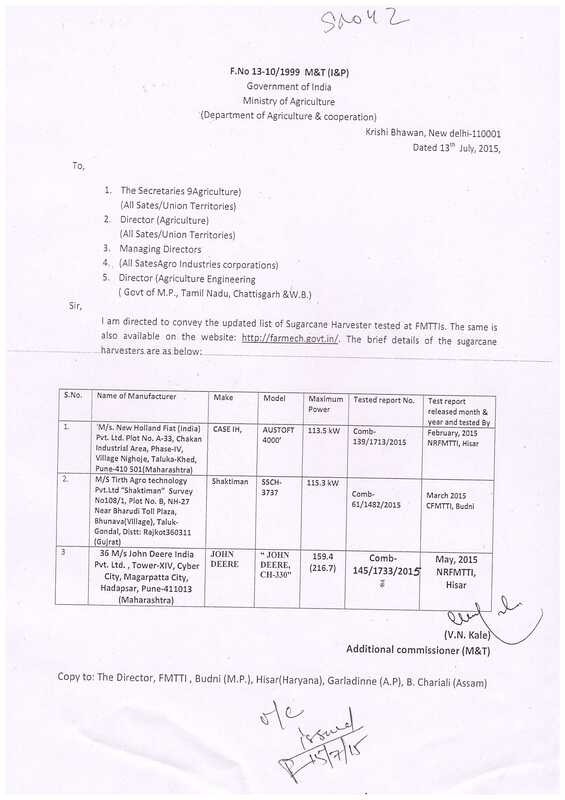 (ii) The applicant may mention in advertisement that the machine/component has been tested at the Northern Farm Machinery Training & Testing Institute, Hisar or Regional Institute ( as the case may be) and shall invariably quote the number of the Test Report in the Advertisement. All the pamphlets or advertisements meant for public should indicate only performance values observed by the Testing Authority. 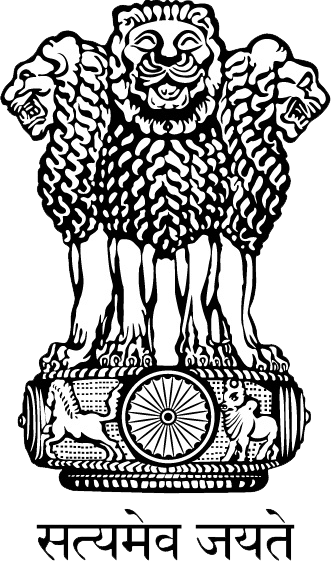 The Government of India reserves the right to publish or to communicate to any person or body the results either wholly or in part together with such comments and additional information as they think desirable. In case of machines which are marketed and are not tested for the benefit of the farmers, the Institute on the direction of the Government, reserves the right to carry out commercial test on any such machine sold in the country and to publish the results thereof. In case of damage to or breakdown of any particular component during the course of testing, the applicant may replace the part with a new one having the same specifications. Testing Authority may at its discretion permit replacement of any component which the applicant has learnt is defective on account of material or workmanship. However, replacement of complete assemblies shall not be permitted. If major breakdown occurs, necessitating replacement of major assemblies, the applicant may be allowed to withdraw the machine. In case the machine is withdrawn from test because of reasons stated above the applicant shall have to submit another machine after incorporation of required changes or replacements. The test report of the first machine containing the results of tests conducted and clearly stating the reasons for non-completion of tests, shall be released immediately after withdrawal of the machine from test. The test report of second machine shall contain a reference to the testing of the earlier machine. Results obtained will be the property of the applicant and will not be communicated to any person or body without the applicant’s consent. The applicant shall neither publish the report nor any extract from it nor divulge test results to any other person or body without prior written approval of the Testing Authority. The report shall not be used for commercial purposes. In case of confidential test, adjustment, modification or alteration in the machine may be permitted at the discretion of Testing Authority.